Shahid Kapoor has turned a year old today, on Feb 25. Born for the son of Vetaran actor Pankaj Kapoor, Shahid made his debut in Ishq Vishq before 12 years, he perfectly cemented his place with versatile and refined acting. Apart from his series of flop movies from 2010 to 2013, he has also given blockbuster movies like 'Jab We Met', 'Kaminey', 'R...Rajkumar', and latest 'Haider' for which he won many awards along with Filmfare Award for Best Actor. 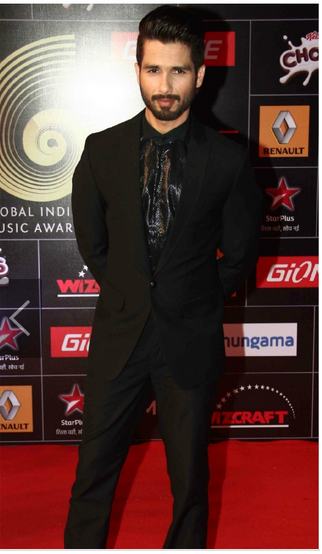 Meanwhile Shahid attended Global Indian Music Academy Awards ceremony held at Mumbai on Tuesday. The chocolate boy posted his photo on his Instagram and captioned it "Heading out after a bit . Gima awards looking forward." Shahid Kapoor's upcoming project is 'Shaandaar' by Vikas Bahl's film. A Very Special Happy Birthday to Shahid Kapoor and Wishes for his Great Success ahead.